Traditional heavy metal band formed in Albany, NY in 1984. Checked around the web a bit for information on this band and very little was available. I did manage to find some tid bits here and there. Most of the pages I read labeled Blacksmith as "power metal." However, when I think of power metal, I tend to think of galloping metal with songs of dragons and dungeons, like Rhapsody or Jacob's Dream, or the crop of German bands like Helloween, Gamma Ray and Edguy. 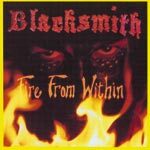 The fact is, however, Blacksmith are just pure 80's heavy metal. Power chords, shredding guitar solos, impressive vocals, and thundering drums. Headbanging mania! Heavy metal, pure and simple, untainted by the various sub-genres that have segregated heavy metal. Their sound is pretty dark, sounding a bit like early Metal Church. This is definitely the case with the lyrics which focus on dark imagery like occultist Alister Crowley ("The Beast") and monster movie vampires ("Theatres De Vampires"). Reminds me of a time when these sort of lyrics were the norm for heavy metal in the mid-80's. This is not the case on all tracks, however. Other songs just celebrate loud heavy metal ("Louder than Hell" ). The production isn't thick, but is dirty and heavy. Overall, a decent release that showed a lot of promise, but unfortunately it was the band's last output. I would have been interested to see where these guys would have gone as they matured as a band and lost the infantile lyrical themes. Quick check on eBay has this CD selling for around $25.